Sometimes cows show up in unexpected themes. 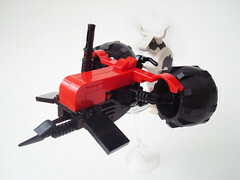 Polywen's Red TRCTR was a winner in the Pigs on the Wing cave racer contest. and BecTodd's Cow Jump was an honorable mention in the diorama category. 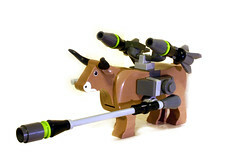 Use this thread to discuss cows in science fiction or other unexpected themes. Note: I did not get permission to use this picture.